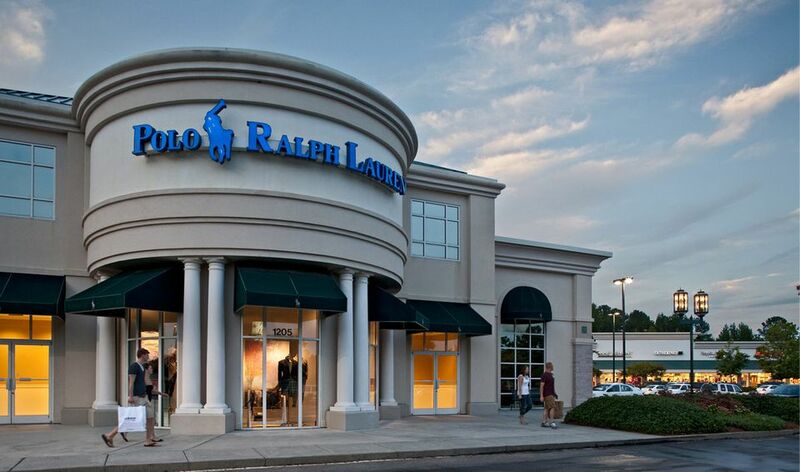 Outlet Malls in Raleigh, Durham, and Chapel Hill, N.C. If you're looking for an outlet mall in Raleigh, Durham or Chapel Hill—an area commonly called the Triangle by locals—you'll have several choices. There's great outlet shopping within an hour's drive depending on which side of the Triangle you are on, with options ranging from large outlet shopping centers and smaller specialty stores such as Nordstrom Rack. If you are on the western side of the Triangle, Tanger Outlets - Mebane is probably your most convenient outlet mall. Built in 2010, this complex focuses on upscale shopping. The 77-store outlet mall houses brands including Coach, Michael Kors, Guess, Ralph Lauren, J. Crew, BCBG, and more. If you're going to make a day of it, be aware that there are few food choices within the complex. There are, however, several places to grab a bite across the street. Stop by Shopper Services when you arrive to pick up your Little Red Book of Big Savings and check the website for special offers to maximize your shopping budget. The Concord Mills Mall is top of the line when it comes to outlet malls. It's located about an hour and a half from Raleigh in Concord, North Carolina (about 45 minutes north of Charlotte). Concord Mills is home to over 200 stores, including outlets like Kate Spade and Lionel Trains, and specialty stores including a Bass Pro Shop. Check the Concord Mills website for special deals and savings events. Entertainment includes Dave & Busters, AMC Movie Theaters, and a NASCAR SpeedPark.﻿ Dining options include chain restaurants such as Bonefish Grill and Outback Steakhouse. The Carolina Premium Outlet shopping center is located in Smithfield, North Carolina, about half an hour from Raleigh and about an hour from Chapel Hill. It's very close to the junction of I-40 and I-95. This is the closest premium outlet mall to the eastern side of the Triangle. Carolina Premium Outlets is home to over 80 upscale outlets, including the Banana Republic, Coach, Eddie Bauer, Gap, and Brooks Brothers. Food options are limited, but there is a Dairy Queen at the outlet mall. Carolina Premium Outlets also has a VIP shoppers' club that offers special promotions and coupons to its members. The club is free to join, and you can join it online. This is one of only two Nordstrom Rack outlets in North Carolina. The other is in Charlotte. Located across from the Streets at Southpoint shopping mall in Durham (where there is a regular Nordstrom store), Nordstrom Rack offers a wide selection of apparel, accessories, and shoes from Nordstrom stores and Nordstrom.com at reduced prices, as well as special value items purchased just for Nordstrom Rack. Burlington Outlet Village, formerly known as The Burlington Manufacturers Outlet Center, is located in Burlington, North Carolina, just a few exits down I-40 from both Raleigh or Durham. Burlington Outlet Village is home to about 20 outlet stores, including a Hanes Mills outlet and a Pepperidge Farm outlet. If you're in Burlington, it's worth stopping in.